How Much Salt Is Too Much for a Baby? While your baby needs some salt for his body to function properly, too much can cause health problems now and as he grows. Keeping your baby's salt intake within a healthy range helps to keep him from developing a taste for salty foods. Many baby-friendly foods, such as crackers, canned vegetables and boxed macaroni and cheese may be too high in sodium. Read food labels to make the right choices for your baby. There are no specific sodium recommendations for children 2 and younger, but keeping it minimal is best. During her first year, your baby should get no more than 1 g per day. As she's probably getting this from your breastmilk or formula, keep any solid food that she's eating salt-free. Sodium regulates your baby's blood pressure and the volume of his blood. He also needs salt for muscle and nerve function. A sodium deficiency is called hyponatremia and is a rare condition. However, should it occur, your baby may experience vomiting, headache, lack of energy, fatigue, irritability, muscle weakness, unconsciousness or coma. Chronic diarrhea or vomiting, certain medications and dehydration or too much water can cause a sodium deficiency. Salt shouldn't be completely eliminated from your baby's diet. Eating too much salt, no matter how old you are, can cause health complications. The amount of salt a newborn gets can negatively affect her blood pressure years later. A Dutch study found that infants who were on a low-sodium diet in the first 6 months of life had lower blood pressure readings at age 15 than infants who ate larger amounts of sodium. Controlling blood pressure can help to prevent heart disease. Your baby's kidneys are not mature enough to handle a large amount of salt, and a high-sodium diet can result in kidney damage, according to MedlinePlus, a service of the U.S. National Library of Medicine. Further, too much salt can increase a baby's susceptibility to carcinogens, increasing the risk of cancer, according to the European Public Health Alliance. Most pureed baby food in jars and boxed infant cereal don't have any added salt, making them healthy and low-sodium options for your baby. However, snacks and foods marketed for toddlers frequently have added salt. Reading labels carefully will help you make the right choices for your baby. If you choose to prepare your own baby food at home, don't add salt. If you're giving your baby a mashed version of something you've prepared for the whole family -- such as steamed, salted and buttered vegetables -- take out your baby's portion before you add the salt and butter. Also limit processed meats, frozen meals, canned soup, potato chips and pizza, all of which can have significant amounts of sodium. 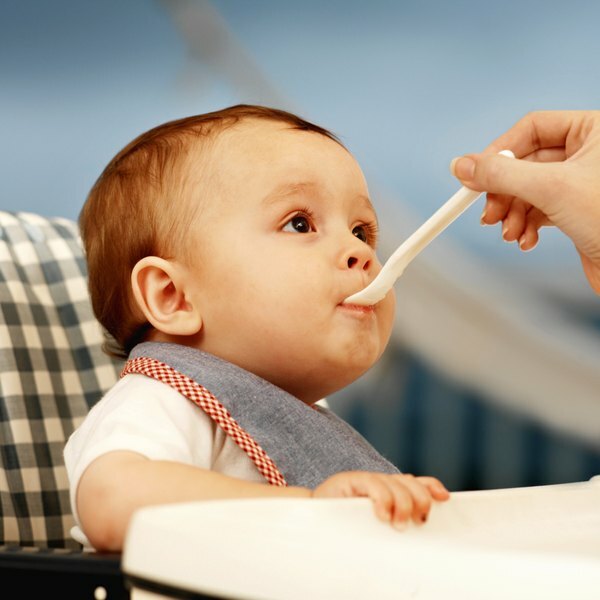 Baby Centre: Can I Put Salt In My Baby's Food?